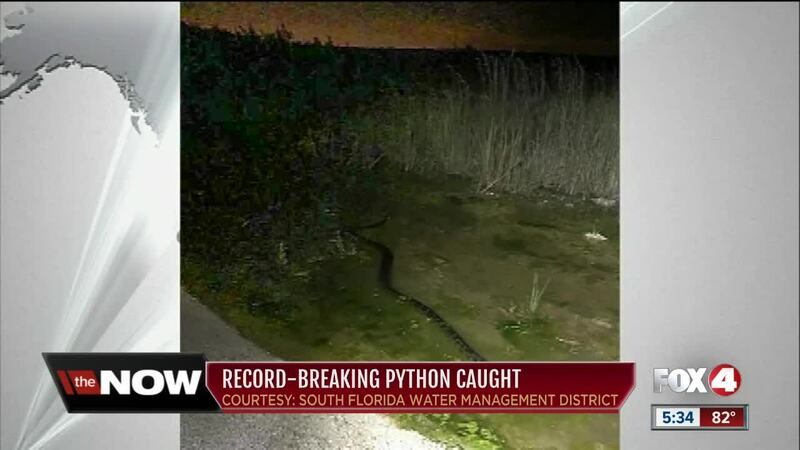 A Homestead snake hunter made the catch of a lifetime Monday in Miami-Dade County, according to the South Florida Water Management District. He captured a 17-foot, 5-inch 120 pound female Burmese python. The district says it's the longest Burmese python caught as part of SFWMD's Python Elimination Program. So this snake just showed me you really can do anything. I just caught this python alone, I was riding along the levee and saw this massive girl in the water. Jumped out and grabbed her by the head and realized how big she truly was. She started wrapping me while I tried getting her up the levee, she ended up making me loose (sic) my grip and as soon as I knew it she had my hand in her mouth. I grabbed my pistol off my side loaded one in the chamber and it jammed. I kept fighting till we were both dead of energy. I finally was able to get her up the levee and l euthanized her as it’s required by our program. The water management district says snake hunters have so far eliminated 1,859 pythons on district lands.